The CD “Blasmusik aus den Bergen” presents 18 works from the extensive oeuvre of his more than 300 compositions by the light muse of the Austrian composer Prof. Hans Koller. Koller comes from a musical family. Already as a child he sings and makes music with the Styrian harmonica and guitar in the family association. He completed his musical education at the local music school, the military music school and the music university in Graz. He pursued his further education autodidactically and at many conductor seminars. This was followed by numerous appearances as light musician in various groups in European countries and the USA. For many years he was active as choirmaster and organist. From 1976 to 2008 he was Kapellmeister of the Musikverein Kleinsölk and since 2000 District Kapellmeister of the music district Gröbmig (Salzburg-Land). His first success as a wind music composer came in 1981, when he won the composition competition for the signature melody of the “Alpine Ski World Championships” in Schladming. He is also the composer of the Schladming World Cup March, which was premiered at the opening ceremony of the 2013 World Ski Championships. In 1998 he founded his own recording studio and music publishing house. He composes works for music groups, vocal groups and wind orchestras. Hans Koller was awarded the Gold Medal for the Services of the Republic of Austria by the Federal President for his musical achievements. In 2009 he was awarded the title of Professor by the Federal President Dr. Heinz Fischer. 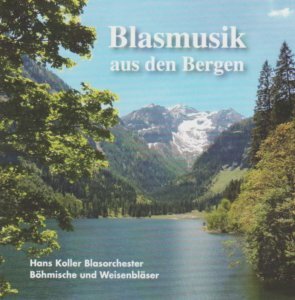 The CD Blasmusik aus den Bergen (Wind Music from the Mountains) contains mainly traditional brass music in the best Austrian tradition, several pieces for saghttps://de.musicainfo.net/detail.php?kat=3&artnr=6001055es wind instruments and some polkas in Bohemian style.